The Georgia Dermatology Physician Assistants (GDPA) puts on an annual conference called Dermatology PEARLS (Physician Extenders Advanced Regional Learning Symposium). It is held in Atlanta, GA or somewhere nearby. It was in October this year, and the next one is scheduled for March in the Buckhead area of Atlanta. There was a maximum amount of CME of 26.5 hours offered, with a possible maximum of 22.5 hours for each attendee. 8 of those hours could be self-assessment if you are in the new CME cycle. 3 workshops were offered - Intermediate Surgery, Hyperhidrosis, Neurotoxin & Fillers - but I didn't participate in any of these. The price for this conference was really reasonable. For early registration a non-GDPA member, it's $300, and if you were a member, it was $275. These prices increased by $75 each for later registration, so plan early! The location was at the Cobb Galleria Centre, and the hotel was adjacent to the convention center. I didn't need to stay at the hotel since my sister lives in Atlanta, but it would have been nice to have just a 5 minute walk to the conference. The conference was 3 days long, which I felt like was appropriate. There was a ton of information presented, and I was exhausted at the end of each day. Everything was extremely organized, and the schedule ran on time. There were a few lectures I would have liked a little more time for questions, but it was nice to know what to expect throughout the day. There was a notebook given that had all of the information for the conference, wi-fi information, and a page for notes on each of the lectures (and I took tons of notes). The speakers were all awesome. There were some physicians and some PAs, and I would just love to spend a day with any of them. I don't think there was a single lecture that I felt like I didn't learn something. There were a few instances where I felt like the information went over my head (immunology! ), but I still feel like I learned a lot. I got so many pearls, and I'm really excited to try them out in practice. It was also reassuring to hear from people who have been practicing dermatology for 10, 20, or 30 years that they struggle with treating some of the same skin diseases that I feel frustrated by. I had a great time at the conference, and I learned so much. This is definitely a conference that I plan on attending again in the future! This past week I attended my first ever Continuing Education conference. 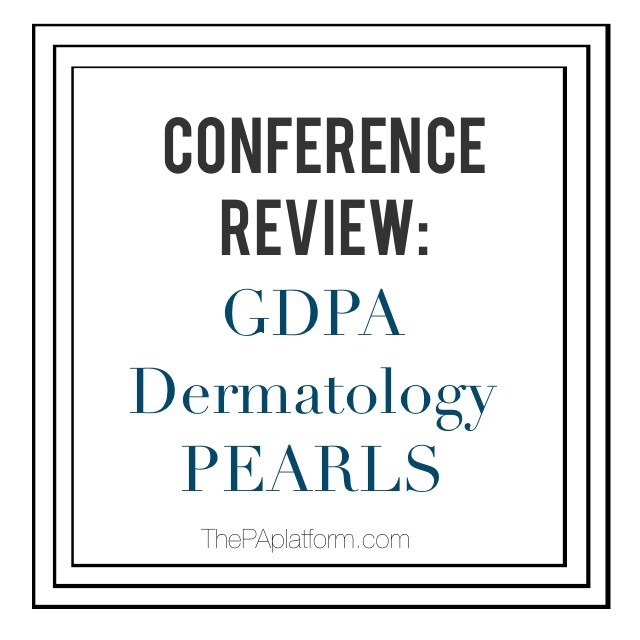 The one I went to was put on by the Georgia Dermatology Physician Assistants (GDPA), and it was their bi-annual Dermatology PEARLS conference. The next one will be in March in Atlanta, GA if you have any interest in dermatology or are looking for a conference. I went there not really knowing what to expect, but it was an awesome conference! (I guess I don't have anything to compare to, but I did enjoy it. I'm going to do a separate post reviewing this particular conference, but here are some tips I would like to share if you are getting ready to go to a conference! No matter what you wear, you probably won't be the most underdressed or overdressed. There were people in anything from jeans to suits. Bring a sweater! It might be cold, and you'll be sedentary for most of the day. Welcome back to PA school! Be ready to sit and listen to lectures for about 8 hours, unless you go to a conference that only has lectures in the morning. There's lots of food and coffee. We had a breakfast and lunch buffet, and lots of coffee breaks with little snacks and drinks. Goodies! They gave me a bag, pens, a notebook, and a jump drive with lectures when I arrived. And then in the Exhibit Hall, there are a bunch of booths with pharmaceutical reps, hospitals, and other medical products that have handouts and information. You can come and go as you need to. You can only claim the CME for the parts that you are actually present for, but it's not a big deal if you need to leave early. The sessions can be very interactive. We had clickers to answer questions, and the speakers were very engaging, and encouraged questions. You need to know generic names. All of the speakers try to be non-biased so they will use the generic names instead of the brand names as much as possible. Learning is exhausting, especially when it's been a while since you've had such intense classroom time. Students welcome! There were a good bit of students at the conference I went to, and I think I would have been overwhelmed as a student, but also I would have learned a lot. It's a great place to make connections and meet people for finding rotations or a job after graduation. And lastly, if you go to a dermatology conference, then everyone will have perfect skin! But seriously, they did. Comment with any of your tips for conferences, or any CME events that you've been to and would recommend!